There won't be much chit chat on this post. I'm squeezing in at the last minute over at Card Patterns for a possible chance at guest designer, and I'm at the last minute at Our Creative Corner also. I've had these papers for a long time so when I saw the post card challenge an idea was born. Then I was looking at the Weekly Inkling #184 from Splitcoast Stampers for the magic snowflake tutorial and bingo this card came together. 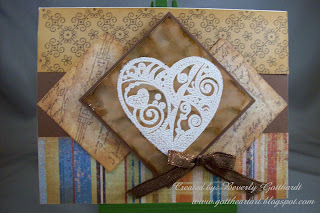 Supplies: Ivory Card Blank 5 1/2" X 6" Halcraft, Papers: White Glossy card stock and the rest from my stash before I started keeping track of where and who, Stamps: Michael Strong: Cloisonne Heart, Ink: Stampin Up: Whisper White, CTMH: Z2108 Brown Bag, CTMH Re-Inkers: Z2208 Brown Bag, Z2211 Chocolate, Stampendous White embossing powder, ribbon: Offray, pop dots. Love it! That heart stamp looks great in white! Good luck on all the designer spotlights you seem to be winning; keep it up and being published in magazines will be next!